Technique: paraffin embedding, PAS-Haematoxylin staining. The ovarian follicles are the most frequent organization in the ovary of animals. They consist of an oocyte surrounded by somatic cells. In mammals, ovarian follicles are generated during the embryonary period and no more follicles are produced after the perinatal period. From this time until the reproductive period, ovarian follicles remain in standby. When the reproductive period starts, and depending on the species, waves of more or less numerous groups of ovarian follicles develop and mature. Primordial follicles consists of an oocyte coated by of single layer of more or less flattened somatic cells. They are standby ovarian follicles located in the periphery of the ovary, close to the tunica albuginea. Developing or maturing follicles are produced during the puberty or sexual maturity of animals and disapear in aged animals, when they become infertile (in humans this period is known as menopause). When sexual maturity starts, some primordial follicles are activated and develop progressively into primary, secondary, tertiary and Graaf follicles. The oocyte is released to the Fallopian ampulla from Graaf follicles, event known as ovulation. During follicle maturation, the somatic cell layer surrounding the oocyte grows in height and becomes cuboidal, forming the granulosa. At the same time, extracellular material is released between the oocyte and granulosa to form the zona pellucida. The oocyte increases in size as well. At this stage, follicles are named primary follicles. As the development goes on, granulosa cells proliferate and granulosa layer becomes multilayered. Many cells from the stroma get arranged around the outer surface of granulose to form the theca layer. Initially, theca is a thin layer of flattened cells that gets thicker during follicle development, so that two sublayers can be distinguished: internal and external. Internal theca show rounded cells and external theca is formed of rather flattened cells. As follicle develops further and gets larger, granulosa cells reorganize to form cell free spaces. At this point, the follicle is known as secondary follicle. Intrafollicular cell free spaces, filled with fluid, join to form only one space or antral cavity. The oocyte is located in the antral cavity surrounded by a few layers granulosa cells or cumulus oophorus. The inner cells in contact with the zona pellucida are known as corona radiata. Granulosa cells surrounding the oocyte are connected to the rest of the granulosa layer by a column of cells. Granulosa and theca layers have been increasing in cell number and thickness. The enlargement of the somatic component results in very big follicle, sometimes protruding from the ovary walls. At this time, the follicle is referred as tertiary follicle. A well-developed tertiary follicle is known as Graaf follicle or Graafian follicle. It is the previous step to ovulation. In humans, the oocyte finishes the first meiotic division at this stage, and therefore there is a secondary oocyte inside the Graaf follicle, and a polar corpuscle as well. Ovulation is the release of the oocyte from the follicle, and therefore from the ovary. The oocyte is first fetched by the ampulla and later goes through the Fallopian tubes toward the uterus. Wrapping the oocyte, zona pellucida and corona radiata are also released during ovulation. 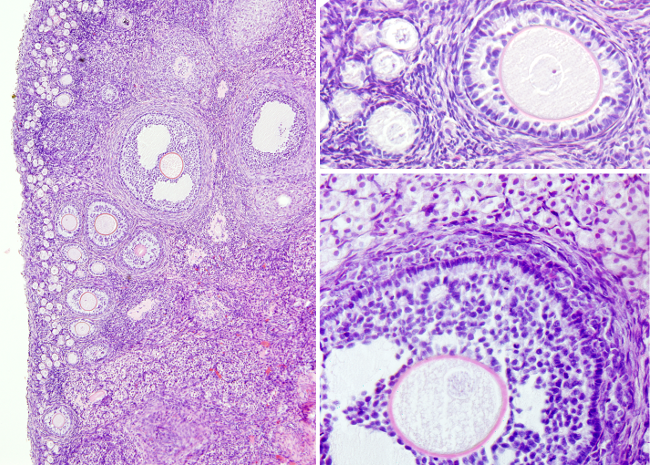 After ovulation, granulosa cells and cells from the internal theca undergo a strong proliferation and form a large structure known as corpus luteum. This is a temporary endocrine structure that releases progesterone and estrogen. If fertilization occurs and the embryo is implanted in the wall of the uterus, corpus luteum remains during the pregnancy. If there is no fertilization, corpus luteum remains active for a few days, then stop the hormonal activity, degenerates, and becomes the corpus albicans, which is later absorbed.